Victorian Nightgowns - What could be more romantic and feminine than Victorian sleepwear? We simply can’t get enough of the sweeping silhouette, the delicate trims, and purest shades of white that are so elegant and demure. But, specialty sleepwear can be incredibly expensive, especially with imported laces and high end Egyptian cotton. Whether you’re on a limited budget or money is simply no object, we’ve put together our top tips for this romantic sleepwear style that has become so popular. Organic fabrics - Upgrade your nightie from basic fabrics to organic cotton. Organic fabrics come at a higher price point, but they’re a special splurge for the woman who wants to pamper herself with the purest materials possible. Full length nightgowns - Go all out with your Victorian gown and choose a long and dramatic version with a floor-sweeping hemline. Choose a long nightgown with added ruffles at the hem, and a more generous amount of fabric for an elegant and dramatic silhouette. Exclusive trims - We adore the extraordinary embellishments that make Victorian nightgowns feel even more special than regular ladies pajamas. Take your trims to the next level with fancier versions, like pearl buttons instead of plastic, and handmade French lace instead of mass-produced lace. Victorian nighties usually have exaggerated ruffled detailing along the sleeves, shoulders, and collar. Long sleeves with ruffled cuffs, dainty buttons, lace accents and satin bows are often used to accentuate their femininity. Hand made or custom made - Treat yourself to a one-of-a-kind version of the Victorian nightgown with a nightie that’s handmade, or really indulge and have one custom made just for you. These romantic nightgowns are definitely more of a splurge than nightgowns that are produced for wide distribution. Head to toe details - Victorian nighties range from simple nighties to those loaded with pretty and exaggerated details and trims. For an ultra feminine and luxurious gown, choose a style that’s dripping with details. Look for lace trimmed cuffs and hemlines, pin tuck seams or rusching on the bodice, and a collar embellished with ribbons and lace. 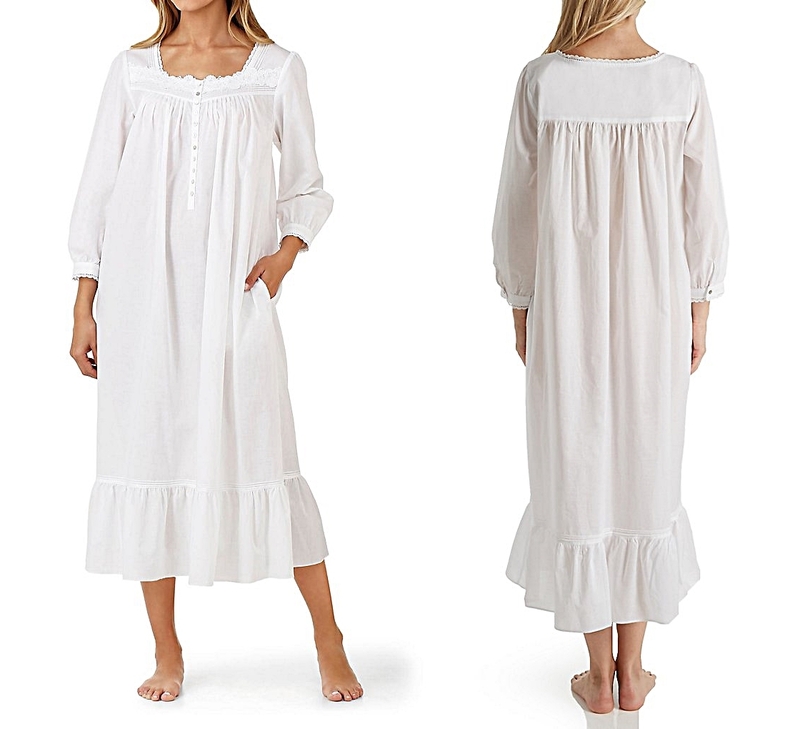 This romantic sleepwear style traditionally has an empire waist. It's floor length and tends to be gathered to a yoke in front and back with a ruffled bodice and wide flounce at the hem. Short nightgowns - Simply put, less fabric generally means a lower price point. Instead of a dramatic, floor length nightie, you can still get the look you love in a shorter length. Knee length short nightgowns can be just as pretty, and a slimmer a-line silhouette without added ruffles can drastically reduce the cost. Shop strategically - Look for Victorian style sleepwear at chain stores or affordable department stores instead of exclusive boutiques. The price tag will always be lower with mass produced styles than it will be at stores that carry elite brands and styles with limited production. The appeal of this beautiful ladies sleepwear has increased dramatically, due to the series Downton Abbey, films like Pride and Prejudice, and the idyllic novels of Jane Austen. Cotton sleepwear blends - If you’re flexible with your fabric choices you can save a bundle. Instead of seeking out high thread count cottons, or the finest organic materials, look for thinner cotton, or cotton blends for lower priced alternatives. Get the feminine and romantic nightgowns that you love and save your hard earned dollars by choosing natural fabrics blended with synthetics. 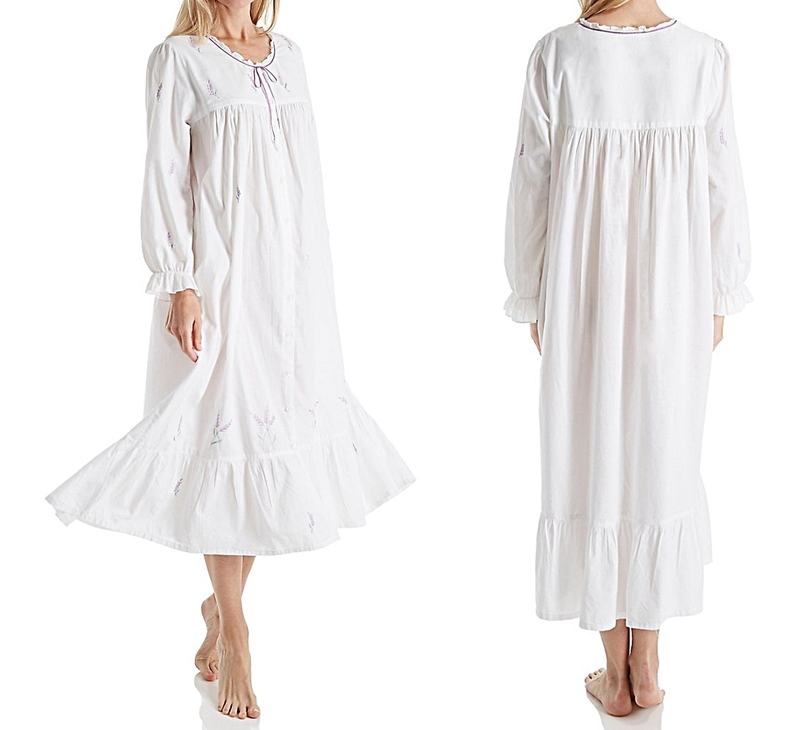 Choose simple styles - Instead of a gown that’s loaded with lace, ruffles, ribbons, and bows, choose simple cotton nightgowns that have fewer trims and details. A gown with a pretty lace collar can give you the same dreamy look, and you can save your pennies by skipping the elaborate hem and cuff details.